With the opportunities given by the success of April/May workshops in Singapore and Malaysia, EnMS-Doc Associates proudly announces its setting up of an activity base in Singapore as of 15 July 2013. 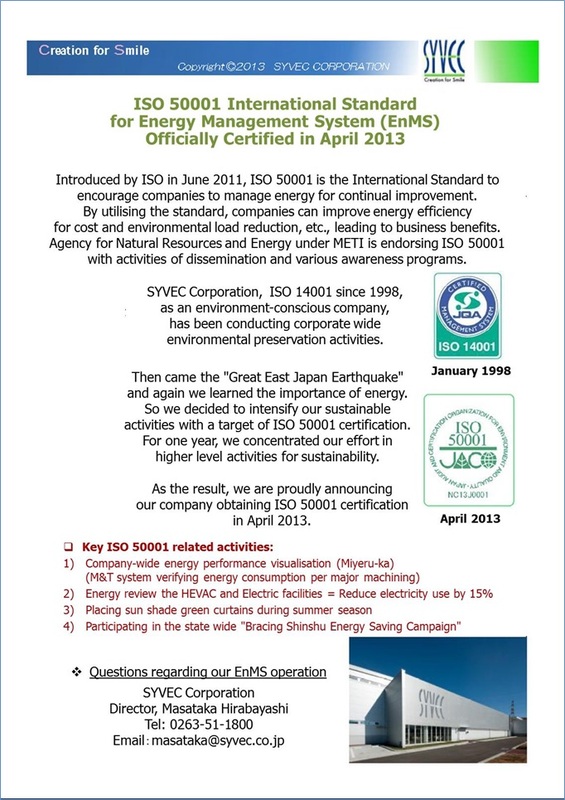 Place attention in China and Japan being far ahead in ISO 14001 and ISO 9001 certification but very slow in ISO 50001. Keep close eyes on the growth mode demonstrated by African countries and how sustainability approach to be blended into the growth. By comparing China and Japan regarding EnMS implementation status, understanding level of ISO 50001 benefit and certification motives, to evaluate the business opportunity in both countries. Strengthen network with Japan to investigate sustainability business related Japanese invested development project for in developing countries. With those factors stated, our intention is transorming our website oriented business style into the style having more direct interfacing with energy users. This does not mean we would reduce our attention on the website. As a matter of fact we think by having more direct interface with energy users, our website contents will be enhanced and more active. We ask your contnuing support to our website. For the occasion, we have created our company overview. In order to promote the superiority of ISO 50001 class Energy Management System (EnMS) in Japan, we took an approach to study how Germany is so overwhelmingly ahead of ISO 50001 certification numbers (1620 out of 3000 certified sites at end May 2013). We then realised that the consistent execution of energy policy by The Federal Environment Agency（UmweltBundesAmt=UBA）plays a significant role. We took initiative to update the activities and policy of UBA for energy users in Japan who are having hard time in capitalising the benefits of ISO 50001 which promotes "Sustainability Business Development" from the global perspectives, hoping it will bring some references to the essence of EnMS. UBA is sending out their messages not only within Germany but extends beyond Europe in the global scale. By questioning how UBA tackles with environmental and energy efficiency issues, how they communicate with the stakeholders, forming teamwork, and while observing there is no trace for the government to enforcing the guideline, we start to see why German energy users are moving towards certification. In the slow movement towards ISO 50001 class EnMS activities in Japan, there was a light in April, a high-tech machining company from Nagano, Japan proudly announcing ISO 50001 certification. We would like to introduce SYVEC Corporation. SYVEC is specilised in custom made high precision components for automotive, electronic, environmental and medical puroposes using thier innovative technology "Cold Forging Progressive Die". SYVEC was establised in 1973. The company has been challenging a high technology development with total supports in the stamping field since then. The company is a leading company of "Japanese Monozukuri" and meet the customer's satisfaction of "high quality" and "lower cost" by developing "Cold Forging Progressive Die". SYVEC investigates the possibilities of stamping and create "Smile" for all the people in the world. For more information about company and their technology, please visit SYVEC wegpage. Availability of "ISO 50001 Certified Comapany and Site List (March 2013 Version)"
An encore EnMS Workshop in Singapore 25-27 Sept.